Socialist Realism generally refers to the formally realistic, thematically artificial style of painting which emerged in Russia in the years following the Communist Revolution of 1917, particularly after the ascent to power of Josef Stalin in 1924. The term also encompasses much of the visual art produced in other communist nations from that period on, as well as associated movements in sculpture, literature, theater, and music. Russia had a proud history of realist painting as social critique, notably through the work of Peredvizhniki artists such as Ilya Repin, and had also been at the forefront of developments in avant-garde art during the early 1900s. But as the realities of socialist rule began to bite in the USSR, artists were increasingly compelled - often on pain of imprisonment or death - to present positive, propagandist images of political leaders, cultural icons, and everyday conditions in the new Soviet republic. Initially incorporating artists of talent and daring such as Isaak Brodsky and Yuri Pimenov, by the 1940s Socialist Realism was a stifling paradigm in which all political critique and obvious formal experiment was snuffed out. Nonetheless, it continued to channel the activities of technically gifted artists, writers, and even composers - Sergei Prokofiev's 1939 cantata Zdravitsa, composed for Stalin's 60th birthday, is still widely recognized as a significant work, in spite of its brazenly propagandist libretto, and unsavory political subtexts. This is one of many fascinating examples of what happens when a totalitarian regime attempts to extend its control over every avenue of cultural expression. There is an important distinction to be made between Socialist Realism and Social Realism; though to some extent, the former grew out of the latter. The stylistic heritage of Socialist Realism was in the tradition of Realist painting which, in Europe and in Russia during the late nineteenth century, had pushed back against the pompous Neoclassical history painting populating state-sanctioned galleries. From Gustave Courbet in France to Russia's own revolutionary Peredvizhniki group, Realism had been a force not just for political critique, but also for celebrating nature and the common lot of humanity. Socialist Realism in Russia and elsewhere maintained the naturalistic style and (superficially at least) the egalitarian impetus of this older movement. But it generally existed in cultures where truthful visual reportage had become impossible. As a result, it maintained the veneer of Realism while generally abandoning its underlying vision. Boris Iagonson, a popular artist of Stalin's era, stated that the success of Socialist Realist painting lay not in any stylistic innovation, but in the "staging of the picture". Socialist Realist paintings often have something of the quality of film-stills, as various actors, playing assigned roles in choreographed scenes, are presented in a highly accurate style, as archetypes of the type of citizen that would populate the successful Socialist state. Well-fed and tireless peasants, fearless leaders, visionary scientists, legendary explorers, and various other exemplars of the Socialist cause, litter the canvases produced in Russia and across the non-democratic part of the Socialist world between the 1920s and 1950s. Like every art movement in history, Socialist Realism supported artists of technical skill and vision (indeed, it is worth acknowledging that only in relatively recent history, and only in certain parts of the world, has art achieved a position of freedom from political propaganda). Isaak Brodsky is one of the many prodigiously talented painters who plied their trade in a style which imposed thematic and formal limits on it. By the 1940s and 1950s, a younger generation of artists, most of whom were born into Soviet rule, were producing a more staid body of images. However, some continued to innovate by whatever means were open to them, turning to effects of lighting, for example, or Impressionist technique, as ways of imposing a stamp of individuality on their work. Brodsky's portrait of Lenin, one of the most iconic works of Socialist Realist art, depicts Lenin at the Smolny Institute, the headquarters of the revolutionary government in the months immediately following the October Revolution. All the details of the scene are intended to contrast with the excessive opulence of Tsarist Russia, from the dustsheets thrown over the chairs in the makeshift office to Lenin's humble attire and expression of calm concentration. Standing at nearly three meters high, the canvas presents the leader as almost life-size, enhancing the quality of naturalistic accuracy which pervades the work. The rendering of the polished wood of the furniture, the texture of the fabrics, and the gleaming floor, show Brodsky's technical talent - the piece is almost photographic in its accuracy. Born in 1884 in modern-day Ukraine, Isaak Brodsky was one of the most talented Russian artists of his generation, and had been tutored in his youth by Ilya Repin, figurehead of the Peredvizhniki group, who was responsible for iconic works such as Barge-Haulers on the Volga (1870-73). Though he was of an age to participate in the revolutionary aesthetic experiments of the 1900s-10s, Brodksy's political commitments found expression through an accurate but emotive painting style influenced by late-nineteenth-century Russian Realism and European Naturalism. Indeed, he was arguably the last great artist of the Peredvizhniki era; in its close attention to informal physical posture, this work stands in the great tradition of Russian Realist portraiture inaugurated in the previous century by artists such as Ivan Kramskoi. Lenin in Smolny was one of a number of works which Brodksy produced after Lenin's death in 1924 to canonize the leader. Like many works of Socialist Realism, it looks back to a halcyon period or event in the early history of the Soviet Union - in this case the first few months of revolutionary government - rather than engaging with the complexities of contemporary reality. Nonetheless, it gives a sense of the fervor and optimism of those early days, and of the faith that was placed in Lenin's leadership, while at the same time predicting the less accomplished version of Brodksy's Realist style that would be imposed from above after 1932. Yuri Pimenov's 1937 painting places the viewer in the back of an open-top car cruising through central Moscow, a female driver at the wheel. All around is progress: cars are everywhere, a tram moves towards new high-rise buildings, while an entrance to the new and much vaunted Moscow subway is visible to the side. Scattered across the scene like flecks of color, busy people hurry about their day. Layers of symbolic imagery can be detected beneath the everyday surface of the image; the red flower propped on the windshield of the car, for example, indicates the artist's support for the Soviet Government. In spite of the strict enforcement of Socialist Realist principles by this point in Stalin's regime, Pimenov's work indicates the limited but inevitable extent to which stylistic experiment continued to be practiced by Russian artists. The painting is broadly Impressionist in style, as if recreating the feel of rainswept streets; but the hazy quality also evokes a sense of dreamy aspiration (just as the female driver nods to social and cultural progress under the new regime). At the same time, as with much Socialist Realist art of the 1930s, it is impossible not to see this image as expressing a grim dramatic irony. The previous year, the so-called "Moscow Trials", in which swaths of government officials and members were tried as saboteurs on spurious grounds, had commenced in courtrooms across the capital. This brought forth the era known as the "Great Terror", which saw unprecedented levels of police surveillance and extra-judicial killings. Artists and writers feared for their lives in this climate, and the "New Moscow" in which Pimenov was working was very different from the one he was compelled to represent; and open-top motor cars (or any car for that matter) were a luxury unimaginable for the majority of the country's population. Standing at nearly three meters tall, Aleksandr Gerasimov's monumental double-portrait shows Joseph Stalin accompanied by his faithful ally Kliment Voroshilov, one of the original five Marshals of the Soviet Union (the state's highest military rank), a prominent figure in Stalin's government and frequent subject of Gerasimov's paintings. Indeed, Nikita Khrushchev would later remark that Voroshilov spent more time in Gerasimov's studio than attending to his political duties. In this painting, however, he, like Stalin, seems a model of concentrated attention. The pair mimic each other's postures in a show of unity as they walk alongside a Kremlin tower. The men appear deep in conversation, their forward glances signifying a focus on the Soviet Union's bright future. In the background, barely visible, the proletariat form a line outside a factory. Unlike other Socialist Realist artists who came of age in the pre-revolutionary era, Aleksandr Gerasimov never had an experimental phase. During the 1900s-10s, he had championed realistic draftsmanship over the formal extravagance of the Russian avant-garde, and by the late 1920s found the tide of official opinion turning decisively in his favor. Specializing in adulatory portraits of the Soviet leadership, Gerasimov rose to become head of the USSR's Union of Artists (set up in 1932 to replace all independent artists' groups) and the Soviet Academy of Arts. Derided as a government stooge by some, his work nonetheless shows a formidable technical skill, and a light-touch engagement with Impressionist technique. This particular work is rich in symbolism. The theme of hope is enhanced by a sky turning blue in the background, as the clouds part after a rainstorm, revealing a spring day. The dark colors of the men's clothes match those of the railings and architecture of post-revolution Moscow, while solitary flashes of red on Voroshilov's military uniform echo the brightness of the Soviet Star atop the Kremlin, and of the Communist flags flying in the background. In such works, we can truly see the cult of personality emerging, a lynchpin of Socialist Realist style. 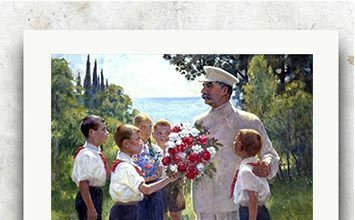 Stalin is presented as a brave, bold and inspiring leader, beloved father of his mass of Soviet children. This work, also known as "Grain", depicts a lively scene of activity on a collective farm or Kolkhoz. A group of women smile and talk as they work the harvest, holding shovels, tying bags, and carrying grain; a central figure rolls up her sleeves, standing tall and proud with a beaming smile on her face. Dominating the composition is a large pile of grain waiting to be transported, whose presence adds to a warm color-palette suggesting optimism, dynamism, and vitality. Born in February 1917, the Ukrainian artist Tatiana Yablonskaya was just a few months old when the Bolshevik Revolution transformed her home-country. Unlike other Socialist Realist artists, therefore, she had never known life outside the Communist regime. Nonetheless, her work often reflects an aesthetic and cultural commitment to her home region, historically known as "Russia's breadbasket" because of the rich soil and temperate climate of the Ukraine. Although this piece is a work of Realism, like many paintings which bear that title it was in fact the product of hundreds of sketches and studies. The artist wanted to make an epic image full of movement, sound and sunlight, stating: "I did my best to express the feeling that overwhelmed me when I was at the collective farm. I strove to express the joyous communal labor of our beautiful people, the wealth and power of our collective farms, and the triumph of Lenin's and Stalin's ideas in the socialist reconstruction of the village." However far this statement was from the horrendous reality of life on many Soviet collective farms, there is an undeniable naturalistic vigor to this work which connects it to the Russian Realist genre painting of the late nineteenth century. Yablonskaya was a garlanded figure in Stalin's Russia, awarded a swath of state prizes, and even becoming a member of parliament in her native Ukraine during the 1950s. In this image we see a mother and her young children gathered in an open doorway, reading a letter from a father or brother at the front, brought home by a fellow soldier sent presumably on recovery leave. The happy group smile alongside the injured friend in uniform, the cheerful optimism of the scene complemented by the bright colors of the sky and the sunlight which drenches the village square, bathing the children's faces in light. The piece pulsates with warmth, suggesting little of the anxiety and trauma which would presumably have accompanied such a meeting. Alexander Laktionov was perhaps the quintessential mid-century Russian Socialist Realist. Tutored in a bright, sharp, photo-realistic style informed by the Dutch Masters, he produced unflinchingly, at times absurdly, optimistic images of life in Soviet Russia, as well as portraits of key bureaucrats, and cultural icons such as cosmonauts. Painted two years after the end of the Second World War, Letter from the Front perhaps provided the kind of palliative gloss over recent traumatic events which the Russian public were craving, and it quickly became a popular classic, winning the Stalin Prize for art (although the Committee for Artistic Affairs was reportedly troubled by the awful condition of the porch floor, and of the clothing worn by the mother). Laktionov once declared that "to work without too much cleverness, without fuss, constantly learning from nature, drinking in the true source of eternal freshness and understanding life - that is true happiness". Given contemporary knowledge of the horrors of the Eastern Front, it is hard to imagine how any artist could depict this subject-matter in such a manner, but Laktionov's popularity with the Russian public, and not just with the powerful circles in which he moved, suggests an enduring public appetite for art "without too much cleverness." After the Second World War, communist rule spread to several countries in eastern Europe - a group of satellite states which became known as the Eastern Bloc - while revolutions in Asia, including in North Korea and China, brought the culture of Soviet Socialist Realism to Russia's Eastern neighbors. In this picture celebrating the conclusion of the Chinese Civil War of 1945-49, we see many of its tenets replicated. Chairman Mao addresses his people in Tiananmen Square during the inaugural ceremony of the People's Republic of China on October 1, 1949. Behind him stand a group of officials looking on while the warm reds and golds of the Chinese lanterns hang heavy with national and political symbolism. These contrast sharply with the blue sky, in which doves fly, signaling a bright and peaceful future (the day had in fact been gloomy and overcast). Lanterns are presented as symbols of prosperity, while chrysanthemums represent longevity. It is painted in a folk-art style, using bright contrasting colors that would appeal to a Chinese aesthetic. Following the communist revolution, the State quickly extended control over artistic culture much as Stalin had done in Russia, in order that their achievements could be immortalized on canvas for the viewing public. This piece was commissioned by Chairman Mao himself, and interestingly saw a number of revisions to the central subjects in its lifetime, as political leaders fell from power in the two decades after its release. The artist also altered the height of the Chairman at various points, adding an extra inch during the original composition, and making the leader taller with each new revision. The painting was reproduced more than a million times after its completion. Dong Xiwen himself had been born in 1914 in eastern China, and had been a sympathizer of the Communist cause before the Revolution, as well as an artist, copyist, and civil engineering student at various institutions in China and Vietnam. He was celebrated for his works combining a nineteenth-century Western Realist aesthetic with a decorative sensibility reflecting his national heritage, perhaps arising from his time producing replicas of wall-paintings as a researcher at the Dunhuang Art Research Institute during the 1940s. This painting remains his best-known work, and a hugely iconic image in China.